Whistler is known for having tons of activities for big kids (or kids at heart), but you won’t believe how awesome our local playgrounds are. I tracked down Whistler’s littlest locals to get the lowdown on their secret stashes and best playgrounds. If you’re anything like me, coffee is a must in the morning. A great spot to get your java fix is at Whistler’s Inclusive Playground. You can find it by Whistler Olympic Plaza, right behind Marketplace. Most importantly it’s right across from two coffee shops. You can sit on the patio of Blenz or Starbucks and enjoy your morning cuppa joe while your kids go wild on the playground. The play structure itself is pretty different from what you might be used to back home. It is made from natural wood and looks like an ancient tree stump. It really matches the natural vibe here in Whistler. It’s like playing in an ancient cedar, right in the heart of the village. The sensory wall adds an inclusive element to this seriously fun playground, making it fun for everyone. If you’re looking for a place that’s a little bit more low-key you should head over to the Tangled Tree playground in Creekside. This little gem is hidden away on Franz’s trail across from Subway. 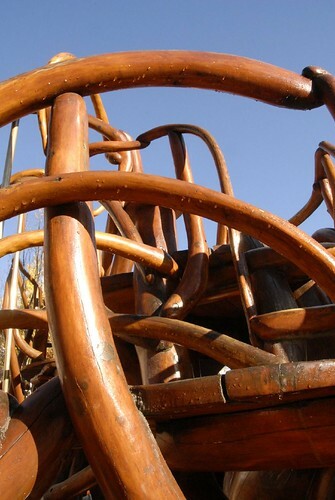 It’s made in the same natural style as the Inclusive playground, but has the advantage of usually being pretty quiet. It’s great if you have little ones, or just want to escape the crowds. If you’ve ever been here in the middle of July you’d know that the summers here in Whistler can get pretty toasty. 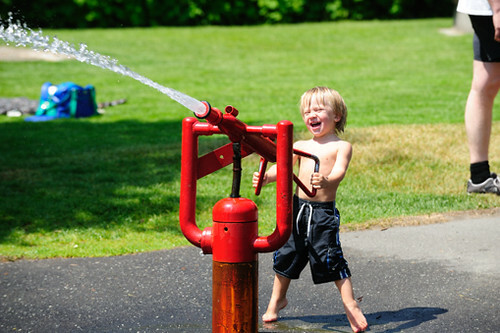 That’s why on scorching days parents and nannies in Whistler know to head over to Meadow Park for the free water park. Your kids can work up a sweat on the jungle gym or tennis courts then cool down in the jets of water. You’d better watch out though – if you’re in range, you’re fair game for a spray down from one of the water cannons. It’s a great park where you can spend the whole day. Make sure to pack a lunch to cook up a family BBQ at one of the many picnic tables. Getting there is a relaxed 4km bike ride in from the village on the valley trail. You can check out the River of Golden Dreams on your way in. With lots of parking and bus access it’s a great way to get away without going too far. Of course it wouldn’t be Whistler without getting a little extreme. We’ve got our training grounds for little rippers. Tucked between day lot 2 and Fitzsimmons Creek you can find the skate park and mini bike park. Bring some bikes over and you can work on banked turns, rollers and even try out a sea-saw. It’s just the right size for little groms to get comfortable on features before they get into the Whistler Blackcomb bike park. Couldn’t fit your bike in your suitcase? No worries, we’ve got tons of rentals up here. Tourism Whistler has some great prices on hourly rentals. The skate park is jammed with tons of cool features. Learn to kick-flip on the box, or take long cruisy turns in the bowl – it’s got a little bit of everything. Check out what other travelers say about other kid-friendly activities on Trip Advisor. For more information, visit the Whistler 4 Kids website. Watch 4 year old Stella killing it in the mini bike park. Megan is an Ontario transplant that moved to Whistler a few years ago to 'live the dream'. She likes long walks in the woods and night paddles in canoes (in case you were wondering). If you're looking for her this summer, head over to Barking Bay dog park in Rainbow Park where she'll be chilling with her pup Kramer.